To give Jesus another chance? Did you grow up with religion? Were Sundays a day of “be still”, “pay attention”, or “wait ’till we get home”? Or, maybe your experience was more entertaining, but the novelty has worn off, and now Sundays are for sleeping in, doing laundry, and watching sports on TV. Maybe you think Jesus is just not relevant. Your life is going great. You have a job, a sweetheart, plenty of amenities. Or, just maybe…it’s not going so great. You want to quit…but you just can’t. You know someday it will kill you, but for now you’re OK.
That was a long time ago. I can’t imagine my life without the love of God. I don’t want to. He has always been there for me. He has given me love when my own mom and dad couldn’t. He has given me courage when I went through cancer. He has given me wisdom when our kids were smarter than I was. He has given me a purpose for living. He has used whatever I offer to him, money, time, talents, to help others, all the while making my heart glad that I accomplished something good. You can’t have a better life than following Jesus. It is not even possible. I finished writing a book in October. It is the story of the way God has reconciled wayward mankind to a perfectly restored relationship through Jesus, His own Son. Take a look, maybe it will help you get started on the road to a restored relationship with Him. All royalties from book sales are being donated to “Waterboys”, to bring water wells to Africa. The Bible never takes the position of explaining the existence of God. He is. The Bible is his way of explaining himself to his creation. 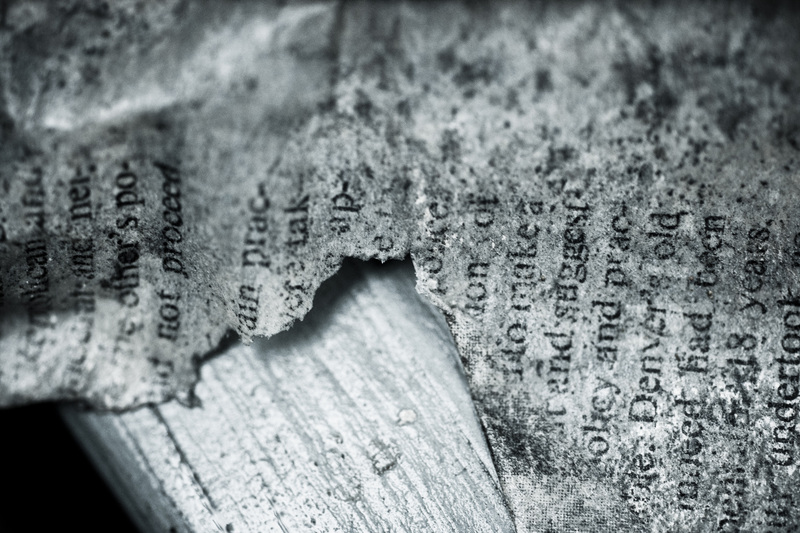 Across centuries, the text of the Bible has been been preserved with crazy accuracy. You see, like the Muslim and the Jew, the Christian also believed his sacred writings needed to be precisely preserved. Read Genesis 1:1 – 2:2, some parts are excerpted here. Let your imagination picture what it was like. How long did the Spirit of God hover over the waters? Think about how peaceful and calming water can be, or how strong and awesome. Which do you think it was? The book of Genesis has several lines that begin with “And God said.” Dwell on those words for awhile. Is it possible for you to just speak a word and something happens? Maybe, for some, a spoken word will force others to spring into action. But when God spoke our known world was formed. He has enough power in his words to create, to give life, where there was only formlessness and void. Nine times in the first chapter of Genesis the words “And God said,” are recorded. What comes to mind when I ask you to imagine a “beautiful day?” The sky? Birds singing? A waterfall? A herd of wild animals grazing on an open plain? Enjoying these situations alone or sharing them with someone you love? None of us were there in the beginning. But, God wanted us to know what it was like. Have you ever made anything, fixed something, or written something? You want to share it with someone who can appreciate it, right? The book of Genesis is attributed to Moses as the author. How did he know what to write? Who told Moses how everything we call “creation” happened? Did God show these pictures of creation to Moses like a movie flashing before him? Did he allow him to dream the scenes? Why did Moses leave out these details? It seems like it was just something everyone understood, why explain how God delivered the information? It would be like explaining “evening” and “morning.” Everyone knows what they are, no need to go into detail. Other Biblical passages describe Moses in direct conversations with God. This is an example of their conversations. Conversations like this lead us to conclude Moses knew God personally. Interesting isn’t it, this passage sounds like we have a personal God, a relational God. Maybe this helps us believe it was God that gave the earth and all living creatures to Adam to rule over (Genesis 1:26-28). Wow, six times God steps back and calls what he is creating “good”. Finally, on the sixth day, he says “it was very good”. He had just created mankind in his own image and put them as stewards over the earth and everything in it. God doesn’t stop there though. What happens next? Creation wasn’t complete, not yet. One piece was missing. Watch what happens in the next chapter. God put a condition on Adam’s existence in the garden. Why? Why did God draw a line? Why did God mess up a perfect situation? Or, did he? God created Adam in his own image. God is in relationship with Adam. He has given him the position of authority over all creation with one caveat: Adam must respect God’s boundary. All creation depends on this fact: Adam must remain in harmony with God. This harmony rests on one condition. Adam must not eat of this one single tree in the garden. God is simply saying to Adam, you may have supremacy over this place. It is yours. I put you in charge. But, just so we are clear, just so I KNOW you will honor our commitment to each other, there is a condition. You must not eat the fruit of this one tree. Early in my career, I was working with a company, where I held a data entry position. I was curious, and figured out how to get into the back-end of their software to see if I could make it run more smoothly. When I proudly let them know how they could increase the efficiency of their software, I received a stern response. They reminded me, in no uncertain terms, that I had violated our agreement. This agreement, that I had not read very closely, stated that I was not to alter the software in any way. I had violated an agreement, even if I had not intended any harm; I had still broken my word. It was a barrier the software engineers had established to maintain security, and I had broken it. An agreement with a condition in the Bible is an oath covenant. An oath covenant requires at least two parties. It is entered into by choice. There is some sort of understanding with at least one condition. Also, with the breaking of the covenant comes a consequence. Adam’s covenant with God required Adam not to eat of the tree God chose. The consequence of failing to follow this condition would be death. God had made Adam in his very own likeness. God had given Adam the Garden, something of his own to take care of, to cultivate. Now with this added condition, they also have a relationship, because of free will. Without a choice they were not free. A true friendship, a love relationship, cannot be forced. If I say “YOU MUST LOVE ME” there is no love. With a choice, with the ability to choose, they can now love. A master-slave relationship was not what God desired. His desire was a love relationship. Just to be sure you understand this format: when the 2000 year-old blog is being posted, the ‘reblog’ will be set apart as quotes, when the narrator is speaking it will appear as a typical post. These words are precious and I don’t want to water them down or take away from their power by my descriptions or declarations. Please let me know if there is confusion over any post. Blogging is not a new phenomenon. People with a message have always had a burning desire to pass it on. These particular blogs were hand copied by dedicated people over many centuries. After printing was invented, they could be produced in greater numbers but always with an effort to produce a perfect, exact copy of the original. As a result, we have copies today that vary only slightly from the originals, and in most cases can be explained by human transcription errors. The 21st century just happens to have a really great medium, which can reach people all over the world with incredible speed and minimal cost. Enjoy these timeless words from men and women who witnessed greatness first-hand. Jesus said, “What I’ve said from the start. I have so many things to say that concern you, judgments to make that affect you, but if you don’t accept the trustworthiness of the One who commanded my words and acts, none of it matters. That is who you are questioning—not me but the One who sent me.” They still didn’t get it, didn’t realize that he was referring to the Father. So Jesus tried again. “When you raise up the Son of Man, then you will know who I am—that I’m not making this up, but speaking only what the Father taught me. The One who sent me stays with me. He doesn’t abandon me. He sees how much joy I take in pleasing him.” When he put it in these terms, many people decided to believe. Taken from “The Message”. I chose this version of the Bible because it uses language like we might speak today. In another blog, I talked about the first covenant with Adam. A covenant at its base is an agreement with a condition. This could be enough, when both parties consent, to form the covenant. However ‘covenant’ also has the idea that it is not casual consent. Each party pledges themselves and all they are, their honor, their name, and their possessions to one another. The partaking of a meal, the exchanging of gifts or names can further signify a covenant. It is an agreement full of honor. However honorable a covenant may be though, it can still be broken. Sometimes when we read a familiar writing or hear a familiar song we know so well, we no longer hear what is being said. Take the children’s nursery rhyme ‘Ring Around the Rosie’. As a young person growing up, I know I recited this poem, dancing around in a circle of friends, to see who would be the last to ‘fall down’. It wasn’t until I was an adult and heard there was another meaning to this rhyme, did I really examine the words and realize the macabre reality behind it. With this in mind, I would suggest we take a look at the first part of the Book of Genesis from a new vantage point. For some of you, it will be to get behind each word and imagine the scenery, the awesomeness of Adam’s position and the incredible relationship he had with the Creator of the universe. For others, you will need to lay aside the skeptical view you have fostered, maybe for many years, and imagine (for just a moment) it could all be written exactly as it happened. Imagine that a loving awesome all-powerful God decided to create a world where He could interact and have a deep friendship with His creation. Imagine. We know from the Bible that God gave the earth and all living creatures to Adam to rule over. (Genesis 1:26-28) Then in Genesis 2:16-17 God draws a line. God has created Adam in His own image. God has been in relationship with Adam. He has given him the position of authority over all creation with one caveat: Adam must respect God’s boundary. All creation depends on this fact: Adam must remain in harmony with God. This harmony rests on one condition. Adam must not eat of this one single tree in the garden. But, without this condition, Adam is just a slave. He has no free will. A true friendship, a love relationship, is not free if it is forced. If I say “YOU MUST LOVE ME!” there is no love. And, at just the right moment, if God jumped in to beat back Satan, He would be in violation of His covenant with Adam. He can’t say, (not Bible–my thoughts) “Well Adam, I am sorry, I take it back, you cannot be the ruler of the Garden. I can see you are not capable. Sorry, I made a mistake.” If He does this He is not true to His nature as God. He would be faithless. The garden was a gift to Adam. Your life is a gift to you. He had to allow Adam to choose. Is your heart breaking? Mine is. Do you have children? Do you know a loved one or friend who is making/has made bad choices? Did you warn them? Did you watch and realize the choice was not yours? God, all-knowing, all-loving, all-merciful, is searching for Adam. Maybe He is searching Adam. Maybe He is ready to forgive. But, Adam and Eve are not ready to repent. He did, she did, it did, not me! Mercy cannot be received without acknowledgement of the transgression. Many years later, after Mankind is ready to ask for forgiveness, a true offering will be made. When Mankind becomes weary of sacrifices and traditions. Then and only then, an offering that is a perfect representation of Man will be offered as a sacrifice for sin. Once this perfect sacrifice is offered…it will be finished. The atonement will not be a covering; it will be a propitiation…a perfect substitution for the sin of every man. This perfect sacrifice—Jesus—will once and for all shed His blood so that Man can be forgiven. Jesus, the NAME above all NAMES, thank you. What can I say? How do I express my thanks for what you were willing to do? And WHY? I know there are times when the ‘apple’ still looks good to me. Even though, like Adam and Eve, I have known you. It could have been me instead of Eve, or Judas, or Peter; I could just as easily have betrayed you. But, you always hang in there with me. You continually extend your hand of friendship towards me. You don’t turn your back on me. Your name is Faithful and True. All I can offer is a humble thank you. What does covenant look like then in the Bible? When God placed Man in the garden, there was a covenant relationship established between God and Adam. So, what is this? It is an agreement with a condition (oath covenant). (paraphrase) “Adam you may have supremacy over this place. It is yours. I put you in charge. But, just so we are clear, just so I KNOW you will honor our agreement, there is a condition. You must not eat of the fruit of this one tree.” Why do you think God put a condition on this promise to Adam? It could have been anything! Adam, don’t eat from………this tree over HERE! Or, don’t wash in THIS STREAM! Or, don’t touch THE FLOWERS ON THIS BUSH! Get the picture? It was just a line, drawn by God, that Adam was not to cross. Why did God do this? Why was it absolutely necessary for God to say that? Well would free will have anything to do with it? God had made Adam in His very own likeness. God had given Adam the Garden, something of his own to take care of, to cultivate. However, without a choice did he really have free will? If you cannot choose one from another, then NO you do not have free will. You have what your father has given you, nothing more. Here’s a recap so far. God made the earth and everything in it. God made Man separately and different. He gave him dominion over creation, with one condition; he could not eat of one particular tree. Then comes the saddest chapter in the Bible. Genesis chapter 3. We don’t know how long it took to get to this point, but in comes the serpent. And…Eve seems like she is close to the forbidden tree. It appears that Adam told her what God’s command was, but she is walking close……..
Stop here. I realize I believe the Bible is divinely inspired. This means that every word, every scene, has had HIS personal stamp of approval. I also realize that I am human, and as such, was not there when this scene was played out. God ends up cursing the serpent, so it sounds like a real creature. If I were Eve, and a serpent started talking to me, I wouldn’t hang around. But, maybe this was the hundredth time he had spoken to her. And, isn’t that how we are tempted? At first, it may seem horrific, we run. But, over time, the horror is lost and we start to entertain the titillation of the action. Then we plot ways to creep up NEXT to it, but not partake. At this point we have probably lost the battle to stay pure, but we don’t accept that. We can still run, we reason…….just one more look. WAIT! Adam was THERE with her! WHOA! Adam, what were you doing? You are master over all of the creation. A creepy snake is talking to your woman and you are just standing there? The Bible always refers to the sin of Man as Adam’s sin. (Romans 5:12 “Therefore, just as sin entered the world through one man”) Eve was the first to partake, but Adam was in charge. This sin was a huge deal. Up until now, the Garden was in perfect harmony with God. When God had finished creation (Gen 1:31) He looked over it and pronounced it very good. Prior to this, there was no sin on earth. God (who is sinless) could walk among His creation. He walked with Adam during the day (wonder what those conversations were like)! When Adam sinned, something happened, something terrible, something that could not be erased. There was separation between God and Man. Adam saw that he was naked because the glory of God left him. (Romans 3:23 “for all have sinned and fall short of the glory of God”) What was left was raw and fearful and ugly. The Garden was not very good any longer. It was out of harmony with God. So, what do Adam and Eve do? They sew fig leaves together to cover their nakedness. What do we do when we realize we have done wrong? We construct righteousness for ourselves! We try to make fig leaf excuses to cover our actions. Another name for this is self-righteousness! They hid from God! When God said “Adam where are you?”, (Gen 3:9) He knew where they were. It seems like God is giving Adam a chance to say he is sorry. Ah, if only we would come to God with our failures, our messes, instead of trying to fix them ourselves. Could this be why so many these days deny God even exists? If HE is real, we have to face our wrongs. If He doesn’t exist………………..we’re good.